Like all sound development, building your organization’s email list takes time. Don’t despair. The key to arriving at your destination is to create a plan. If you don’t already have one, sign up with an email marketing company. Don’t make the mistake of many nonprofit organizations and go with the “free” or least expensive service. Doing this right from the start will save you headaches down the road. I highly recommend icontact for their outstanding customer service, ease of use and great deliverability stats. For more information, check out this top ten review site (you might notice that while Mail Chimp is free initially, the eventual cost is higher than icontact). Decide what information you want to collect. You’re engaged in a multi-step process here, remember? I recommend the bare minimum – first name, last name and email – to start. It gives you enough information to personalize your emails (if you’re going to collect those names I want to see you using them!) and begin engaging your donors. Add your sign up box to your website. We’re talking every page and in the upper right portion of the site. Don’t make your visitor scroll or search to find it. Want to go bold? Try using an interstitual like that featured on my site. Give a compelling reason for signing up (“sign up for our enews” is not compelling). Create a welcome email, personalized and sent within 24 hours. Better yet, send out an entire welcome packet of three to five emails evenly spaced over a period of two to four weeks introducing new subscribers to your organization. Here’s where you can get creative! 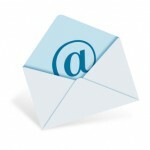 Establish a regular schedule of communicating with your subscribers via email. Whether it’s every week, every other week or once a month, donor-centric fundraising must be consistent. Keep in mind “multi-step process” and don’t make every email an ask (I average one ask per five to ten emails). Consider sponsoring a fun contest, perhaps via Facebook. Could a supporter or board member donate a hot item like an iPad? Be clear that entrants are also signing up for the organization’s newsletter. Ask readers, supporters, board members and staff to forward your e-news to friends and family. Can your board members include a tagline in their own business signature line? Every piece of collateral that your organization puts out should have a line about your e-news – including your letterhead. And finally, my best tip? You won’t have overnight success, but by consistently delivering fabulous content – think different, think fun, think authentic – you’ll grow a list of loyal supporters over time. These are great tips. We have been working a lot with nonprofits to get them to think now about how they can better acquire contacts, so they have a high quality list in place when it is time to solicit.